SKU: N/A. Category: Medical. Tag: Enzyplex. The “carrier” powder is Montmorillonite, a rare earth clay which enhances the function of the enzymes. 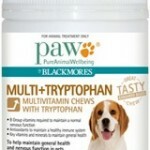 It slows the passage of nutrients through the intestine, and improves nutrient digestibility. It also alters bacterial fermentation ability in the large bowel, reducing flatulence and improving stool formation, as well as binding bacteria and endotoxins, helping to normalise gut function and prevent diarrhoea. * Malodorous, semi-formed faeces and intermittent diarrhoea produced by insufficient pancreatic digestive enzymes which allows abnormal digestion and overgrowth of bacteria in the bowel. 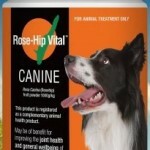 This can be relatively frequent in dogs. Mix well with food. If food is dry, dampen with warm water after mixing. Allow to stand for 5 – 10 minutes to allow pre-digestion to commence before feeding. 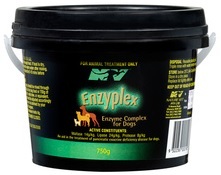 ENZYPLEX is safe to use with all Nature Vet products. Store below 25°C (Air Conditioning). Store in dry place. Replace lid tightly after use.